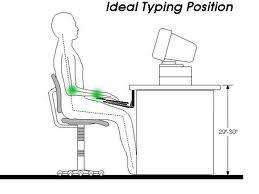 A common answer for this has been to raise your desk so that your arms are bent at a 90-degree angle when you type. This is a partial solution: a 90-degree angle keeps your wrists straight when you type (assuming your keyboard is level with your desk top) and helps prevent the wrist strain and injuries that come from improper wrist posture. However, maintaining this right angle for long can put a strain on the flexors of your forearms, substituting one type of pain for another. That is why we recommend keeping your arms at a neutral position when you work. The easiest way to picture our most “neutral” position is to think about how astronauts’ arms hang when they’re floating in their sleeping bags aboard the International Space Station – their arms relaxed at a shallow angle, with their wrists straight. This natural “Sleeping Astronaut” position keeps your arms at a comfortable angle, with little muscle flex in your forearms and wrists. As you can guess, most desk surfaces are too flat to facilitate this kind of ergonomic posture – hence, the 90-degree rule to keep wrists straight. A few desks, like Anthro’s Elevate II Adjusta, or the Experts Choice Omega Everest and Denali, include a desktop portion that can adjust to a negative angle to create better wrist angles necessary to type more comfortably. With these ergonomic workstations, your ideal desk height will be much lower than elbow level – the Omega desks, for example, position your keyboard close to your belt line, where your hands naturally fall when you stand. Other workplace tools that can affect the height of your desk include ergonomic keyboard trays, which also tilt at a negative angle: the Stowaway, for example, affords 20 degrees of negative tilt in addition to 7″ of vertical adjustment. 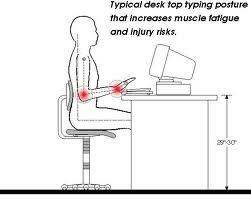 Depending on your particular tray, you may find it best to work with your wrists above or below the desk top. Ergonomic keyboards like the Microsoft Sculpt or Kinesis Freestyle can also change the ideal height of your work surface, adding a couple inches here and there. It’s important to think about all of these additional height factors when considering your next standing desk. 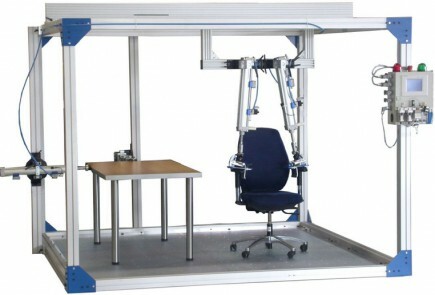 Once your workstation is set up, take some time to familiarize yourself with working at different heights. Find a configuration that keeps your wrists and arms as straight as possible. As always, listen to your body: If you begin to feel stiff, adjust your desk up or down a skosh to reduce some of the strain that comes from staying in the same position. 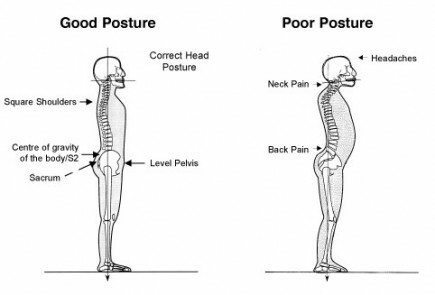 There’s no one proper standing- or walking height, so feel free to experiment with your desk to find what works for you. 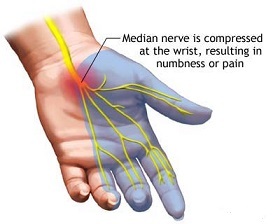 The wrists should rest comfortably on a soft cushion to “anchor” the hands from the gentle swaying motions of body, without placing too much pressure on the contact point. The front of the keyboard must be higher than the back of the keyboard by anywhere from a few degrees to as much as 30 degrees, depending on what feels comfortable for you in either walking, standing or sitting position. The best way to achieve this is with an under-desk keyboard tray. While your wrists should rest at a shallow angle, your hands should not be in a perfectly straight line with the forearm. Instead, they should tilt up a few degrees for best use of the small muscles in the hand. Too much of an angle, however, will result in carpal tunnel constriction. Think of it this way: the point where the fingertips touch the keys should be in a straight line with your forearm. 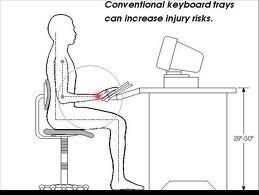 Using an ergonomic keyboard that keeps the hands further apart and with the thumbs higher than the pinkies is also very important for keeping the chest open, shoulders back, and avoiding the rounded hunch posture. The mouse or trackball should be located as close as possible to the body. Over-reaching for the mouse will place undue strain on the shoulder and it will exacerbate “pivoting” on the spine, which can result in interesting back pains. See illustration for the proper angles. Set your desktop height to the appropriate level to attain these angles.